No matter how hard we try, we can’t avoid stress, it’s part and parcel of our every day living. A stress isn’t always a bad thing. In the short-term, stress can even be motivating. A short-term stress makes us work harder and be serious in pursuing our task at hand. The problem arises when it lasts for a long periods of time, it can also become harmful to our mental and physical wellbeing. If you are experiencing a lot of stress, it may affect your behavior and lifestyle. We know many who adopt unhealthy habits such as excessive drinking or smoking due to excess stress. You may eat less healthy food and exercise less or not at all. Remember, stress doesn’t affect everyone equally, for me when I am in stress for more than a few days, it shows on my behavior, I tend to get more quarrelsome, depressed and short-tempered. A long-term stress prevents you achieve your goals. What can you do to reduce the stress you feel? There are steps you can take both at work and during non-work hours that might help you to feel less stressed. First you should determine what works for you. Ask yourself what matters most to you or gives you the most satisfaction at work and/or at home A list of about five is ideal. Of these, which energize you the most? These should be considered your top priorities. Take yourself from work completely over the weekends, spend time with your wife and children. Have a mini staycation. If the latte factor makes you feel less stressed, have coffee every day. Setting up a ‘to do’ list is an easy task, the harder part is to continue on them. Once you’ve developed your top priorities, you should make an effort to commit to and reserve time for them. For example, if it’s important that you exercise three times a week, schedule and mark that time on your calendar. If you like to paint, set a time every week on that hobby. We all have hobbies and we should allocate at least a minimum amount of time towards it. Consider how you can reduce or eliminate doing the things that you did not include on your list or that are particular “energy sappers”. make a list of these things and try come up with alternative ways of doing things or, if possible, not doing those. If you are stressed out at work, talk to your manager and see if some of your tasks can be distributed. It’s one thing to be a ‘yes’ man and it’s another to suffer for days and month because of that. Do not let your relationships take a hit! Discuss your commitments with significant others at home, or your friends at work so that they can support and encourage you. Many a times I found out the way out on my own after I had discussed things with my wife. I felt less burdened. Always maintain a smile, thank others, greet people passing by and help others when you get a chance. Giving gives us a feeling of being great. When you be good to others, they would naturally be good to you in return, helping your stress to go down. One of the great stress relievers that I’ve found is to play video games. I take a few moments off, playing a video game for around fifteen minutes or so, and I’m then reinvigorated to go forward. For the world outside of freelancing, a boss has to allow a ten minute break – I’ve taken walks when I’ve been stressed out at my job, and I come back refreshed and ready to take on the world. Human beings are so diverse. 100 of us can list 100 different things as stress reliever. A timely break at work helps me too. But too many breaks hinder the continuity, isn’t it? Love this post and the new OCAAT tone! I was reading your post and nodding my head to all the points (except the caffeine) and found myself asking, but how do I find the time? Time management in my understanding is an important tool for managing stress. Excellent post! I often find myself not talking about my problems as much…I should work on that. Thanks you so much for stopping by and commenting. Talking about your problems is almost the half solution tot he problem. Rest half is finding the way and implementing it. Do what best suits you. It’s like you are reading my mind, SB. Stress has started to affect my health in a bad way. I have started exercising and a new diet on Feb 1. It has definitely gotten in the way of achieving my goals. I faced this situation 4 years back. 2007 was a bad year for me. Had financial and job related problems,both. Nothing helped till I changed my job. All the best and only you can find the best way out for yourself. 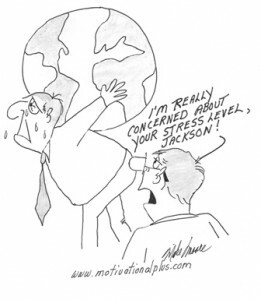 There’s no question, stress can impact your health and emotional well-being very negatively. Sometimes people stress themselves out by worrying / dwelling on a problem (basically, thinking about it all the time) without doing anything about it. Getting out of that habit can help immensely too. Stop worrying and start acting, yup. I fully agree with you here. Know your stress and then figure out what’s the best way to come out of it seems to me a right recipe for de-stressing one self. I made a list of 15 activities/things I enjoy and try to choose from that list when I am stressed. I also like Emily’s suggestion of video games. I’ll show my age here, but I used to find a nice game of Tetris quite relaxing. A good game of tennis relaxes me quiet a bit. But don’t think sports is a stress reliever for long-term prolonged stresses..it never works for me. I like that Bertrand Russell quote… even if you’re saving lives every day, work shouldn’t be placed above friends and family. Great tips. One thing I find that really helps me is exercise. I get such a release from it and often feel a lot better. It clears my head and helps me sleep which is important for dealing with stress. I find a good laugh helps relieve the stress for me. Good to be back on your team SB! Stress-related spending and impulse buying often go hand in hand – and when I know I’m stressed I make it a point to find something constructive to do with my time. Doing something active helps – and it doesn’t add baggage to my finances, my closet, or my waistline! Thanks for the insights!